Beauty brand Weleda are experts at bottling the vitamins and antioxidants found in superfoods. Editor Trudi Brewer shares a fruit-based skincare range that will give your complexion a firming boost. I've always had a "thing" for pomegranates. Not only do they look beautiful, and taste great but the firming effects this exotic fruit has on the skin is exceptional. Weleda has captured that power in a luxe-y skincare line that is high in vitamins A, C, and E, and rich in essential antioxidants that will benefit your skin every day. From the farm to the lab, the goodness from pomegranate fruit, and the oil from the seeds offer a bounty of anti-ageing benefits. This exotic fruit is rich in micronutrients and powerful antioxidants, including polyphenols, gallic and ellagic acids, punicic acid, and omega-5 fatty acids. Together these nutrients help fight free-radical damage that we are all exposed to daily from our environmental and the blue light radiation from our smartphones and laptops. Pomegranate extracts are famous for boosting cell regeneration, increasing our natural collagen and elastin production (the building blocks of our skin, these proteins gives our skin firmness). Finally, pomegranate extracts offer a bevy of anti-inflammatory and hydrating benefits too. This range is NATRUE certified with natural with organic ingredients,no synthetic ingredients are in the range and naturally, it’s cruelty-free. If your skin is feeling tight and dry, or looking dull, a daily dose of the magic this fruit has to offer may be just what your 30 plus complexion needs. Weleda Pomegranate Regenerating Body Oil, $39. Each morning I drench my skin with this multi-benefit body oil, to prevent dryness and irritation once the temperature drops. The blend of rejuvenating oils such as jojoba, sesame and macadamia, and a zesty fragrance of orange, davana, and vanilla makes it my go-to winter skin treat. It's also been brilliant on those days I need an emergency frizz-fighter on flyaway hair strands common with curly locks like mine. Weleda Pomegranate Firming Serum, $49. A clear gel-like serum that gives the skin an instant shot of hydration thanks to the ingredient line up of millet extract and pomegranate juice. I use it morning and night, it absorbs in seconds ready for a day and night cream to be layered over the top. Once you try this serum you will be addicted. 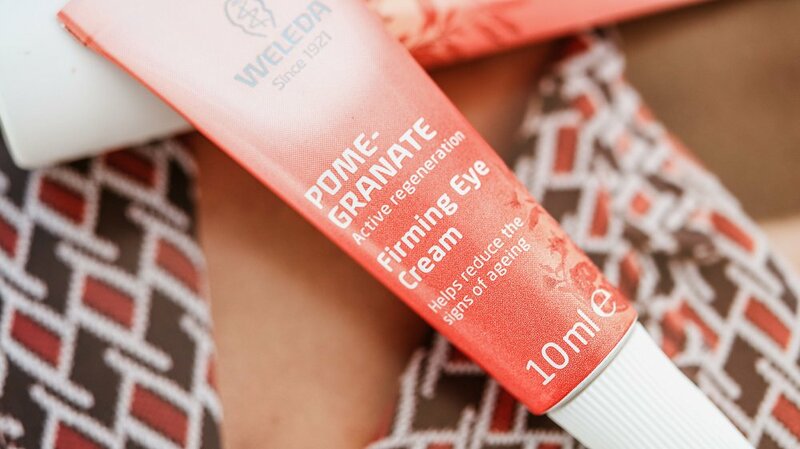 Weleda Pomegranate Firming Eye Cream, $46. Organically-grown pomegranate and golden millet are fragrance-free and ideal for the delicate eye area. This ingredient combination works to firm and refresh the skin under the eyes, but what’s most noticeable is the less visible look of fine lines. It’s dermatologically tested, and safe for those who wear contact lenses. Weleda Pomegranate Firming Night Cream, $46. What skin needs daily, is a dose of luxurious firming cream before bed. The organic pomegranate seed oil kick starts the skin’s natural repair process, while you sleep, helping to firm and strengthen ageing skin. For me a subtle scent is important in a night cream, the musky, citrus combination in this skin treat is divine. Weleda Pomegranate Firming Day Cream, $46. There is no doubt this day cream arrests dryness with the blend of pomegranate, macadamia, argan oil, millet, sunflower seeds, and olive oil. It leaves an instant sheen on the surface of the skin, that once absorbed boosts moisture levels all day. It’s also the ideal size tube of cream for travel. Weleda Gentle Cleansing Foam, $32. Each day I feed and protect my skin, but cleansing is right up there when it comes to a good daily routine. This 100 percent certified natural easy-to-use foam, containing organic witch hazel and white mallow, which removes makeup and oil swiftly, but it's the refreshing scent of lemons, oranges, and lavender, that makes it a great way to start each day. 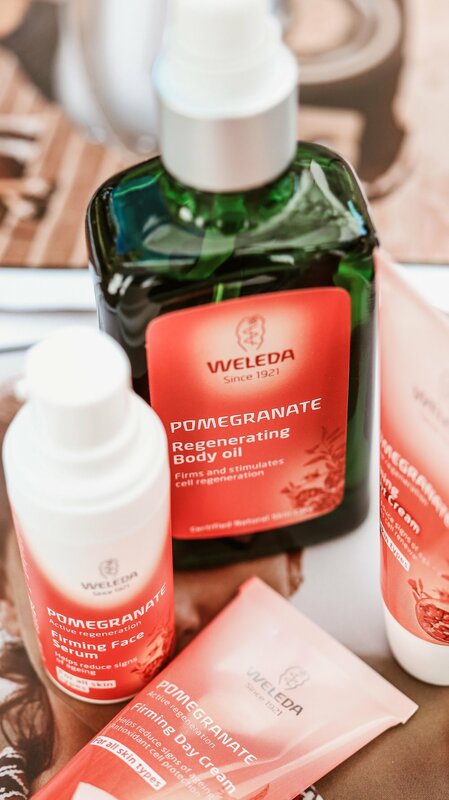 Weleda Pomegranate products are available here and at selected online retailers, including Farmers, health stores and pharmacies.